In nature there is no such quantity of sweet food, which consumes the modern man who has learned to distinguish refined sugar. It's sweet, but very harmful in large doses, the substance destroys the enamel and promotes penetration into the formed cracks of microbes. As a result, the tooth starts to hurt, while for sugar it reacts particularly sensitive. Sugar is found in many foods in its natural form, but in very small amounts. The most natural of glucose in sweet fruits – pears, grapes, peaches, but they can't match its composition with cakes, ice cream, candy, milk chocolate. Since then, as people learned how to extract sugar from sugar cane or beet, his health began to deteriorate teeth. Sugar falling on the tooth enamel, causes its chemical destruction. The enamel of human teeth is the most solid in the body tissue, there a huge number of inorganic substances and very little water, it is able to withstand a strong load, but with a sweet deal not. Sugar destroys enamel and is under it dentin. It happens gradually: one eaten candy will not cause such consequences, but if you eat sweets regularly and don't brush immediately after that, the teeth remaining in the mouth glucose slowly start to affect the enamel. As a result, the teeth formed small cracks where infiltrating disease-causing microbes, and sugar is an ideal environment for their reproduction. 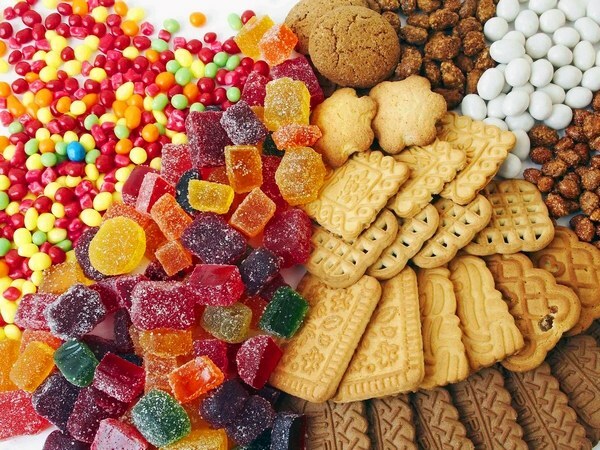 Increased acidity, which is provoked by sweets is also favorable for bacteria. So there is tooth decay. Sugar acts on teeth, not only outside but inside as well. To digest a large amount of refined sugar the essential vitamins and calcium, which are mainly contained in the dental tissue. The disadvantage of these substances affects the health of teeth – they literally destroyed from the inside, since the supply of the necessary elements do not have time to replenish between meals a sweet food. Why sugar causes pain in the teeth? If the surface of the tooth has a crack, and it formed cavities, bacteria gradually destroys the tooth and tubules, usually hidden under the enamel, are exposed. They lead directly to the nerve, so when they receive the food, especially the sweet, the nerves react to it, and the man feels a sharp pain. Moreover, to respond to sweet can even healthy teeth, if they have cracks or defects, but no cavities. Thinned, too delicate enamel is also a cause of pain from sugar. Often suffer from sweet teeth and the gums – if the gums are bare, then in the resulting pocket can get sugar, which also causes pain. Pay no attention to the pain, even if it takes a few seconds after a hit of sweet on the teeth, it is impossible. Be sure to consult the dentist had advanced tooth decay can lead to more serious disease, periodontitis. Start to brush your teeth after each meal and after each use of sweet, and it is desirable to reduce or completely abandon products containing refined sugar. Replace cakes and pastries and dried fruits, they contain less glucose.